Today on 2nd June 2014, Telangana the youngest and 29th state of India is born. Yesterday I was in markets of Hyderabad and saw the city turned into pink the colors of TRS or Telangana Rashtriya Samiti the political party that spearheaded the movement for a separate state of Telangana. But statehood is a state of mind and Telangana movement started long ago and a demand for Telangana has been decades old. With the making of Telangana Telugu people also get 2 states, just like Tamilians have Tamil Nadu and Pondicherry, Hindi speaking people more than 7, Maharashtra and Goa share Konkani as a common language in parts, now we have another people who speak one language but have 2 states. I will not get into the history of the movement you can do Google search for the same. Today Telangana is a separate state and 3.5 crore people are hoping for a better life. 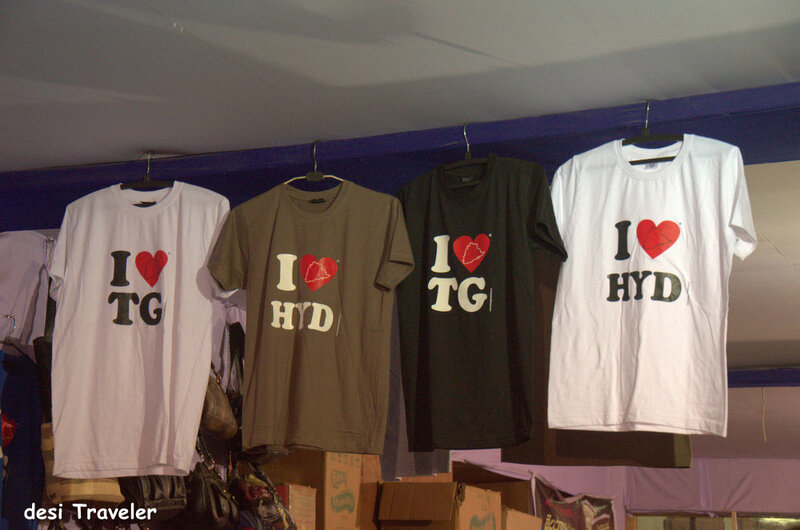 Here I want to share this picture of some T-shirts showing I love Telangana and I love Hyderabad that I clicked in Numaish this year. The I love Telangana T shirts were selling briskly with the vendor doing good business. Let me focus the post back on to travel and without any kind of political debate would like to highlight that the new state needs to work on a lot of things and developing a robust Travel and Tourism sector needs to be given priority. Though Telangana will have some of the best names in IT like Microsoft, Google, Facebook, CA, Accenture, Dell and many BPOs like Bank Of America, Wells Fargo, Broadridge, HSBC etc employing thousands of people in the state capital these companies employ highly qualified urban or semi urban youth. The main reasons for demand for a separate state was jobs and while IT/BPO is one of the most promising sectors for job creation for urban youth it is Travel and Tourism that generates jobs for the local rural youth and help them find jobs closer to their homes. Nagarjuna Sagar Dam and surrounding places like Ethipothala falls. 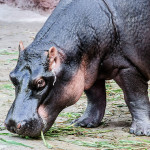 There is hardly any Tiger or wildlife sector in Telangana but the Nagarjuna Sagar Srisailam belt can be developed to attract wildlife enthusiasts. Thousands of Hyderabadis visit Tadoba, Bandipur etc. while there are no visitors to the Tiger Sanctuary in the backyard of Hyderabad. Infrastructure needs to be boosted in Warangal Fort and Temple sector, same for Chilkur Balaji Temple which has huge potential. Rural tourism needs to be given a push where people visit handicrafts centers like Pochampally etc. Promote the unique festivals of Telangana that can be developed like Goa Carnival e.g Bonalu is a very unique and colorful festival here. The new formed Tourism department needs to tie up with social enterprises like GHAC to involve local communities in creating opportunities and explore areas that can be developed. 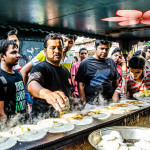 Food Walks in Hyderabad : While there is heritage walks in and around Charminar, the food walks for the famed Hyderabadi cuisine are all private sporadic efforts by foodies. A lot of cities in Europe thrive on Food Tourism, I see no reason why the Hyderabadi Biryani and other delicacies from the region can not make people come for a finger licking food tour. 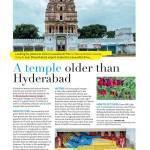 Within Hyderabad promote places like Taramati Baradari, Sitaram Bagh and Nanakramguda Temple, and close to the city places like Bhongir fort needs more attention. Hyderabad has so much potential than just Charminar. 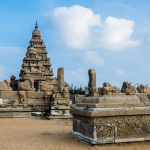 Work with Travel Bloggers just like Kerala Tourism does to extensively promote tourism in the state. Give special tax benefits for new hotels/resorts coming up outside of Hyderabad in smaller tourist centers. Remember a dollar invested in Tourism creates more jobs than IT sector. The IT jobs can go tomorrow to another low-cost country or state but Tourism jobs will stay if you can get repeat visitors. All these places and many more in Telangana have huge potential to develop in major tourist attraction provided a good infrastructure like budget hotels, toilets, good roads etc are provided. Here is my list of tourist attractions from Hyderabad in Telangana, Seemandhra, Karnataka, MP, Goa etc. where desi Traveler has visited. 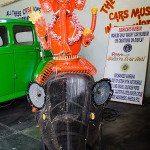 PS: I am one of the outsiders in Hyderabad who have made the city of Nizams his home. I am thankful for the city and its people for accepting me as it is with all my warts and moles. Wishing a very bright future to both Telangana and Andhra Pradesh. I am pretty sure the hard working and highly competitive Telugu people will contribute in rewriting the history of prosperity coming back to people of India. For India has always been a rich country, in a history of more than 5000 years the poverty left by 200 years of colonial rule will soon be a blip on the graph. Jai Telangana, Jai Andhra, Jai Bharat. wow what a comprehensive coverage of areas which need to be developed ! Srsly a lot of concentration is needed on many tourism spots !